The Zoom Air units work wonders according to many Nike LeBron Soldier 12 owners. They say that the shoe provides great impact protection and energy return. Several shoe reviewers notice that the toe cap overlay is soft, comfortable, and flexible. Most wearers claim that the traction pattern works well even on dusty courts. A lot of buyers are happy with the overall lightness of the shoe model from LeBron James’ signature line. Many users observe that the engineered circular-knit upper provides excellent comfort. The straps at the midfoot provide superb foot containment and support according to some reviewers. Though there are only a few options, a good number of users mention that the colorways of the Nike LeBron Soldier 12 are nice and elegant. They say the color combinations are aesthetically appealing on and off court. For a few wearers, the interlocking straps are something new in basketball shoes. They find the style appealing on court and for street wear. A couple of reviewers call the traction pattern as “Racetrack Herringbone.” According to them, the shoe surprisingly performs really well like LeBron James himself. Some ballers claim that the heel counter and raised midsole of these basketball sneakers from Nike help prevent foot slippage. A good number of testers are happy to report that the LeBron Soldier 12 is versatile. The middle section is too narrow according to one buyer. He says that this issue causes the Nike LeBron Soldier 12 to feel imbalanced. Kevin Durant’s 11th Nike sneakers run narrow as well. A couple of reviewers do not recommend the shoe for outdoor use. They find the outsole rubber to be too soft that they worry that it wears out easily. A small number of users find it difficult to figure the right amount of tightness with the Velcro straps. Some testers observe that the Nike LeBron Soldier 12 lacks the right amount of outrigger. They say it could have provided more support and stability. The Nike LeBron Soldier 12 has lived up to its name. At a surprisingly affordable rate, the signature shoe comes with premium materials and technology for excellent performance. With all these attributes, the Nike LeBron Soldier 12 is indeed a sure win for your foot. Lebron Soldier XII is ready for battle! To win a battle, you depend on your "soldiers" and these shoes indeed, will not let you down. The silhouette looks familiar with no laces and velcro straps, however, some minor adjustments in design make this Lebron a new all-time favorite. And if you know about previous Lebron shoes, you don't take for granted the ease of putting on and taking off of a shoe. Straps are secure, let's dive in. I exclusively played with the Lebron Soldier XII inside. These shoes will give you the brakes to cut when you want. I will admit there is a sense of 'drift' which some might consider a slide but after playing in them a few days in a row, it was not even noticeable. It's not the absolute best I've ever experienced where every step gives me that squeaking sound, but they are pretty good. The fit with the Lebron Soldier XII is good. When I wore them the first time and walked around, I had to adjust the straps. I like the new cross foot design and it is quick and easy to readjust in a game versus dealing with shoelaces! After wearing for a prolonged amount of time, the tightness around the sides of my mid-foot was noticeable. When playing you forget about it, but in between pickup games you may adjust them for comfort. Also, around the toe areas, it's somewhat loose, not to the extent that my feet slip when I plant but there is some wiggle room. All of the things I've mentioned aren't really complaints, just observations while playing. They fit and feel good overall. I have no complaints with the Lebron Solder XII as far as weight is concerned. I could easily make quick steps, recover on defense and explode to dunk the ball whenever I wanted. The durability of the Lebron Soldier XII is a concern in the toe area. While the shoes felt great, breathable and look really good when wearing them, I've noticed blemishes on my toes when I used them for 4 consecutive days. I'm hoping this doesn't wear away so soon. The darker shoes obviously also do hold dust, so in gameplay, if someone steps on them, this pair will require some wiping to maintain a clean look. The cushion in the Lebron Soldier XII felt good. My last workout involved a lot of driving to the basket and finishing with dunking the ball. Landing felt great for the entirety of my workout. Probably the best feature of the Lebron Soldier XII is the support. I got full support in these shoes in my ball handling drills and in pick up games. I felt completely confident doing anything and everything I wanted to with no slippage at the ankle when planting, exploding or landing. The Nike Lebron Soldier XII offers value and comfort. This shoe will be very popular amongst all age groups of basketball players and for good reason. The plethora of colorways will offer good value propositions when they go on sale. No shoe is perfect and for the Lebron Soldier XII that I tested, the wear and tear on these shoes may become evident if you play hard in them. They are extremely comfortable, with great support and again, are easy to take on and off without help for those shopping for elementary age players. These shoes are a great buy, even better if you can catch a pair you like on sale! 100% worth it... I really enjoyed playing in these, guys! Overall, will I recommend the Soldier 12? At its price point, you will get an excellent all around hoop shoe that has very good cushion, enough impact protection, very supportive upper, and a very comfortable all around shoe. Overall the Soldier XII is an excellent shoe IF you can get the Velcro to stay and if you can’t just add extra strong Velcro. Great traction: yep. By far the most important aspect to me. Good cushioning: yep even though there are better set ups that might feel better underfoot this just plain works well. Good fit (if you get the Velcro set). No support or stability issues. Great containment. If you want a shoe that does everything very well, this is your shoe. I think it does everything just as well or better (traction) than the Soldier XI but just barely. I’m on the fence about giving it a first team rating due to the Velcro issue that can arise for some but for me I just had to pull tighter to eliminate the problem. If not for that possible issue I’d give it a first team rating but for now I’m going to give it a second team rating. In the second quarter of 2018, Nike released another shoe model in the LeBron Soldier line. At $140, the Nike LeBron Soldier 12 comes with a Phylon midsole with Zoom Air units. Its circular-knit textile upper gives wearers a comfortable and flexible ride. The multidirectional traction pattern on either solid rubber or gum delivers a reliable court grip and control without attracting dust and debris. The signature shoe features two hook-and-loop straps for easy and secure lockdown. The Nike LeBron Soldier 12 is also praised for its versatility. The textile upper brings comfort to the foot with just enough space for the toes to wiggle. With all these attributes, the Nike LeBron Soldier 12 is indeed a sure win for your foot. Cushion. The Nike LeBron Soldier 12 features a Phylon midsole with Zoom Air units at the forefoot and heel. The Zoom Air units absorb impact and provides energy return. A comfortable ride is afforded by the soft Phylon carrier. The midsole is slightly curved to deliver arch support. Traction. Depending on the colorway, the outsole of the Nike LeBron Soldier 12 comes in either solid rubber or gum. It boasts a multidirectional traction pattern that is great for both lateral and linear footwork. The spacious and deep grooves provide a secure grip on court floors, effectively preventing slippage. Length and Width. The LeBron Soldier series run long and narrow according to most reviewers. They say wearers with average-sized feet can go true to size or half size down if they want a snugger fit. However, it is still best for them to try the shoe on before purchasing. As for those with wider feet, they can opt for a different shoe. Lockdown. The one-bootie construction of the Nike LeBron Soldier 12 ensures a one-to-one fit. To keep the foot in place, the signature shoe has two criss-crossing Velcro straps. The straps are stretchable, making it very easy for wearers to make adjustments. The upper of the Nike LeBron Soldier 12 is made of circular-knit textile. The engineered fabric is durable and flexible like the Battleknit upper of the Nike LeBron 15. This one-bootie signature shoe also has neoprene in its construction for a more stable and comfortable fit. The Nike LeBron Soldier 12 is available on NikeID. Wearers can customize the shoe model to match their personal style. Colors of the entire shoe can be modified; wearers can particularly play with the colors of the speckles, callouts, and the Swoosh. Like other LeBron signature shoes, the Soldier 12 can be paired with either long or short pants. Though they look great for casual use, the Nike LeBron Soldier 12 best attracts eyes on-court. The “Bred” colorway is a regular colorway for LeBron James basketball shoes such as the Nike Air Zoom Generation, LeBron Soldier 11, LeBron 4, and LeBron 8 just to name a few. The colorway has a black base with white and university red accents. The Bred colorway retails at $140 and was released on May 18, 2018. With a black base, the heel and toe of the LeBron Soldier 12 come with camouflage overlays. This camo goodness is also called the Hazel Rush colorway. Released on April 26, 2018, the Nike LeBron Soldier 12 Camo retails at $130. The “Light Bone” colorway has a neutral upper with hints of red at the ankle collar and outsole. The Swoosh comes with a gold detailing. It features a gum outsole that matches the upper nicely. Some reports say that the LeBron Soldier 12 Light Bone almost resembles the Air Yeezy 2. The Light Bone colorway becomes available on May 31, 2018 at $140. The OG 25 Straight colorway of the Nike LeBron Soldier 12 comes with a white upper with midnight navy straps and rear panel. The blue midsole and outsole have specks of mineral yellow so that they match with the mineral yellow LeBron logo and Swoosh. A “WITNESS” callout is on the pull tab. The Nike LeBron Soldier 12 OG 25 Straight is made available on May 31, 2018. The SVSM colorway honors of St. Vincent–St. Mary High School, LeBron James’s alma mater. The shoe is dressed in white with green stitches and a green ankle collar. The rear half of the white midsole has green speckles to match the entirely green outsole. A green ‘IRISH” callout is found at the midfoot. At $130, the SVSM colorway is released on May 5, 2018. 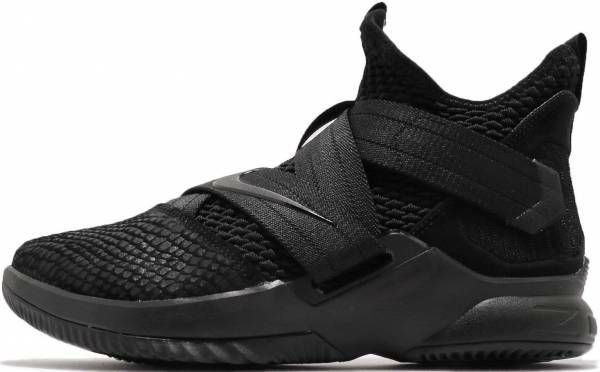 The LeBron Soldier 12 Zero Dark Thirty is also dubbed as the “Zero Dark Thirty, 23 Activated” by some reporters. This colorway honors the dark times when LeBron James shut himself out of social media to focus on his game. Its entirely black upper is made of a combination of mesh and suede. It has a reflective Nike Swoosh. It is released on April 25, 2018 at $140.